There was negligible distortion of the passenger compartment in the frontal test. Adapative airbags and seatbelts tailor the timing and the degree of restraint to suit the size of the occupant and the severity of the impact. In this case, both the driver and passenger were well protected. The A4 scored maximum points in the car side impact test. In the pole side impact, the chest was adequately protected and there was good protection of all other body regions. The head restraint provided good protection against whiplash injuries. The A4 scored maximum points for its protection of the 1½ year old infant and the 3 year old child based on dummy responses in the full scale tests. There was no label clearly warning of the dangers of using a rearward-facing child restraint in the front passenger seat but the presence of ISOFIX markings was clearly indicated in the rear outboard seats. The bumper scored maximum points for its protection of pedestrians' legs but the front edge of the bonnet scored none. The bonnet was rated as predominantly poor for the protection it offered to the head of a struck adult. 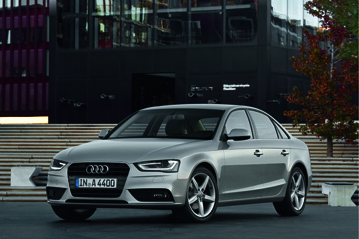 Electronic Stability Control is standard equipment on all of the A4 model range. Both front seats have a seatbelt reminder system which met Euro NCAP's requirements.